American artists traveled to the exotic corners of their own country as well as to Europe and Asia to seek picturesque subjects. When this painting was made, the American West remained a vastly unexplored and fundamentally foreign land. The Atchison, Topeka and Santa Fe Railway hired Moran to create this monumental panorama for use in promoting tourism to the region. 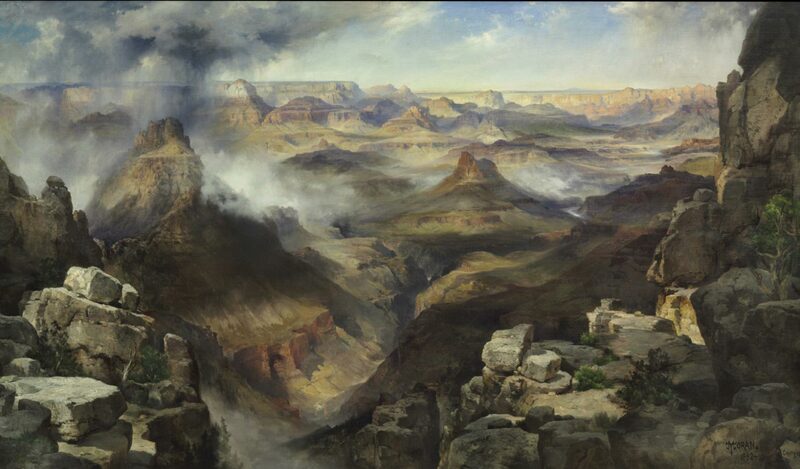 Thomas Moran was a well-established landscape painter and illustrator in Philadelphia before he accompanied a scientific expedition to the Yellowstone region in 1871 and made the first paintings of the spectacular scenery for which he would earn the nickname Tom "Yellowstone" Moran. Based upon his own meticulous sketches and photographs, his Western views were geologically accurate, but presented with dramatic effects of light and atmosphere reminiscent of the work of J.M.W. Turner. Moran's turbulent skies and glowing colors could convey a sense of place unequaled by a photograph, especially when he chose a canvas large enough to suggest the vast spaces that were as unimaginable to Eastern viewers as the spectacular geological features themselves. His monumental canvases were in fact influential in the establishment of national parks in the West. Although his paintings were always based upon his sketches, photographs, and direct experience, Moran did not hesitate to modify the landscape to enhance pictorial effect. The Museum's painting has two dates--1892 and 1908--which indicates that he changed the work to suit his own changing painting style. Darrel Sewell, from Philadelphia Museum of Art: Handbook of the Collections (1995), p. 290.